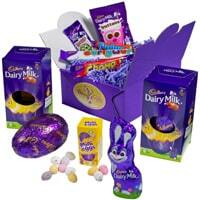 You can get yourself a free box of Cadbury Easter box of chocolates from online Cadbury store. Just follow our link and register for a free account and then use their redirection link to get this freebie from Cadbury. Click on “GET IT HERE” button, create a free account on TopCashback, use their link to visit Cadbury's website and make a purchase. You will get 100% cashback for the amount you spent.